…Oddly enough, that makes it a little hard to review, because it’s a game that you play in short segments (About three or four times a day, if you’re trying to raise a chick), but completion will take months. And some of those times are nice and relaxing (Getting nice letters from the sentient, oh-so-cute borbfolk, complimenting you and your garden), and some… Some feel a bit frustrating. At first, anyway. You are, on the one hand, my cute son. On the other, goshdarn, parenting, eh? For example, raising chicks. 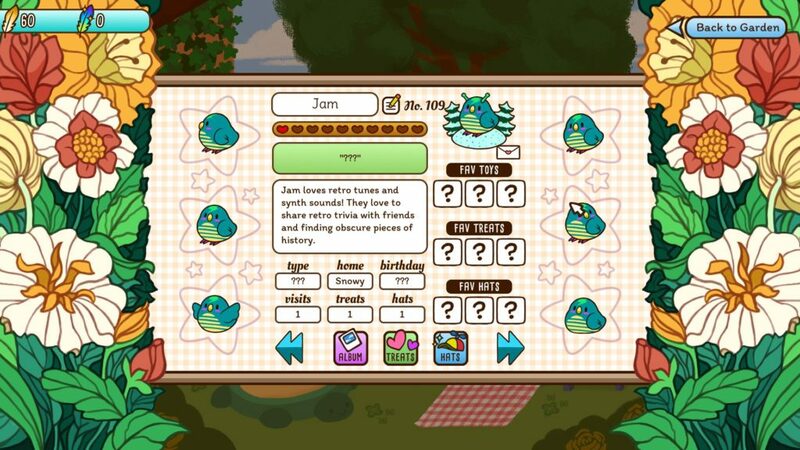 While it’s a side endeavour, its Tamagotchi like nature (MUST EAT. MUST SLEEP. CLEAN MY BIRDYPOOS!) could lead the genre weary to feel this is an obstacle to completion. Thankfully, it is not, to my knowledge, possible to screw this up, because, let’s face it, you would probably feel as bad as I would if my cute tiny birb died on me. The other side content is minigames (Two of which, Stacking Birds and Bird Jump) appear to only give cosmetic items, and a story mode, about… Well, the staff of the Tiny Bird Garden, and the possibility that they might end up selling it off. 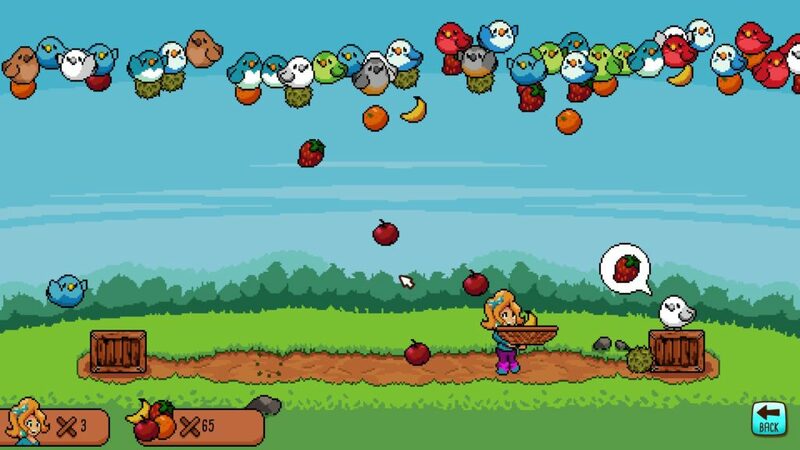 It was nice that the Borbjewelled game led, after a little while, to enough bird toys in the shape of bird shaped trophies to get me seriously started. Jam and the Virtubirbs is, perhaps, my favourite SatAm Bird Content. In the end, though, while I find some aspects more fun than others, I only have two complaints and a bug to report. 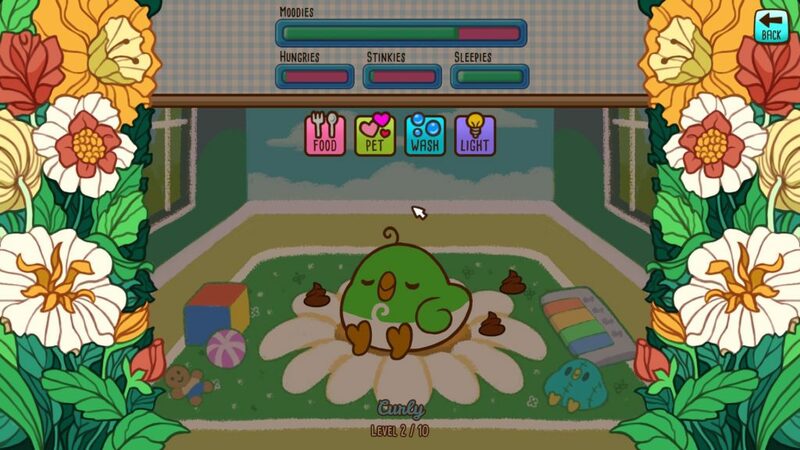 The complaints are both to do with the visuals, specifically, wanting a somewhat better windowed mode, and that the hearts on the Birb status screen (Where you get to see how much they love you, what toys/treats/hats they love the most, etcetera) is hard to distinguish due to a lack of colour/value disparity. The bug, meanwhile, isn’t game breaking, but it is slightly annoying: My flower in Tiny Bird Jump is now on the right side of the playing field rather than the centre, and, while this doesn’t significantly impact it, it is obviously unintended. Beyond that, the birds are cute as heck (With some good descriptions), the game is tight, easy to understand, and you’re under much less pressure than at first appears to be the case. Enjoy the garden. Enjoy the light, kindly story. And take your time getting to know those Tiny Birds. The Mad Welshman loves his borbular friends. 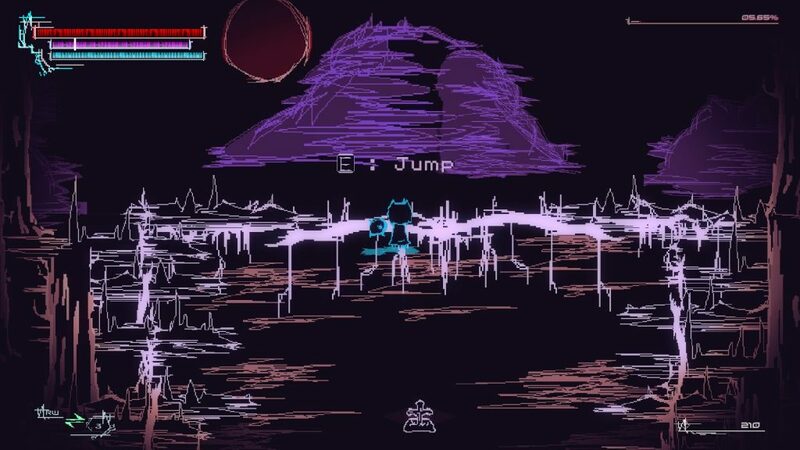 The Mansus, this game’s Dreamlands, in all its glory. *Poked from off camera* Oh, sorry, wrong capitalisation. All its Glory! 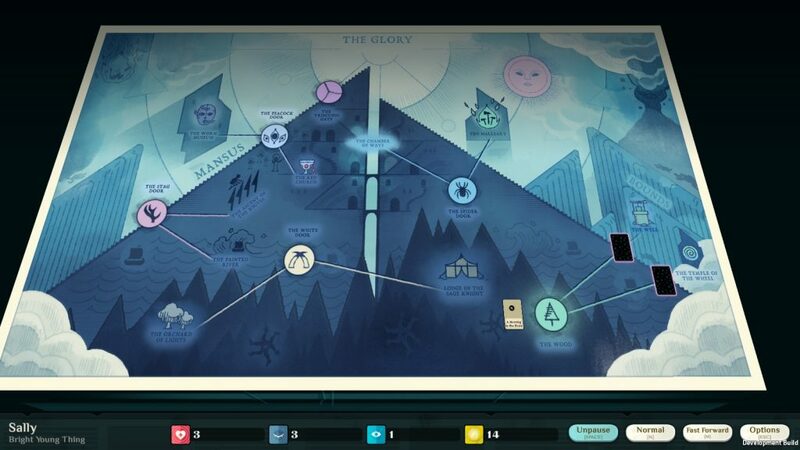 To unpack this, nominally, Cultist Simulator is a real-time strategy/RPG hybrid where you, a person of some description (be that a doctor, a policeman, a working joe, or other things) get a hint of a deeper world, a world where, if you really, really want, if you work hard, and make sacrifices, you too can become a big player in the world of ancient magics. Of course… Some of those sacrifices are human, and some of that work is murder, or suppression of evidence that you’re doing all this stuff, and I say “nominally” regarding the game because it isn’t really much like anything that’s come before. The cards, for example, are all on timers. The events are on timers. And, while you can pause and interact with them all, unless you’re doing just that, the event cards can only be viewed individually, so you’re always going to miss things, partly because here, a lack of tutorialising is a deliberate choice. Fun fact: Cult, and occult are words whose Latin roots are two letters apart. Colere, to cultivate, and Celare, to hide. 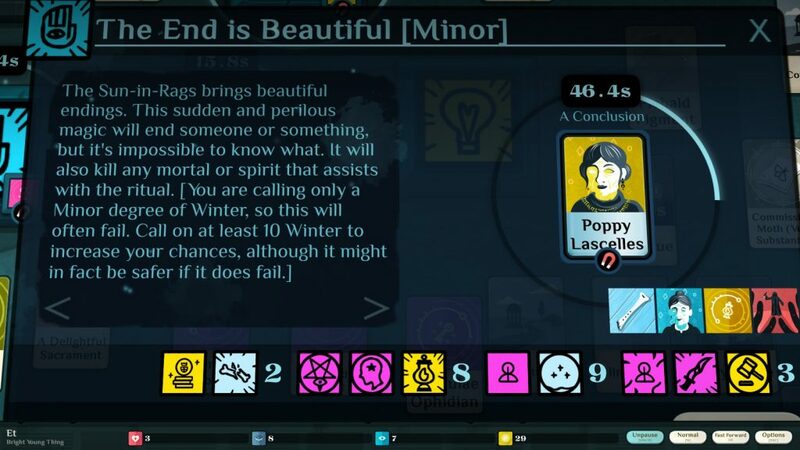 As such, a review of Cultist Simulator, by its very definition, is a somewhat spoilery experience. Starting only from a card or two, the world expands, with more verbs (that’s the squares as opposed to the cards) unlocking in play, more threats, more opportunities. Teachers are discovered, lore is uncovered. Dreams, strange places, possible cult members, and, of course… Hunters. People who would rather (and with good reason) see these ancient secrets remain buried, even if their methods, their name (The Bureau of Suppression) seems a step too far. There’s one heck of a narrative here, but interpreting it is as much a learned skill as getting to the point I have. 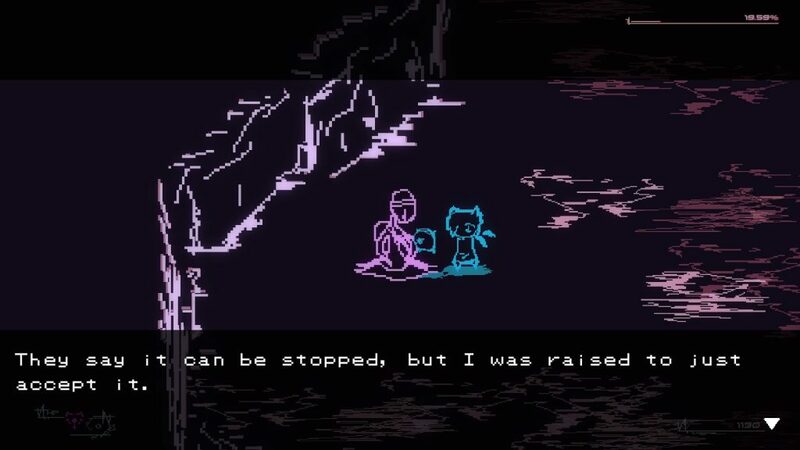 This is one of the high points of the game, that the world expands, and is explained as you go, in fragments, little pieces. With atmospheric writing, overlays to the board, changes of music, the world is created. 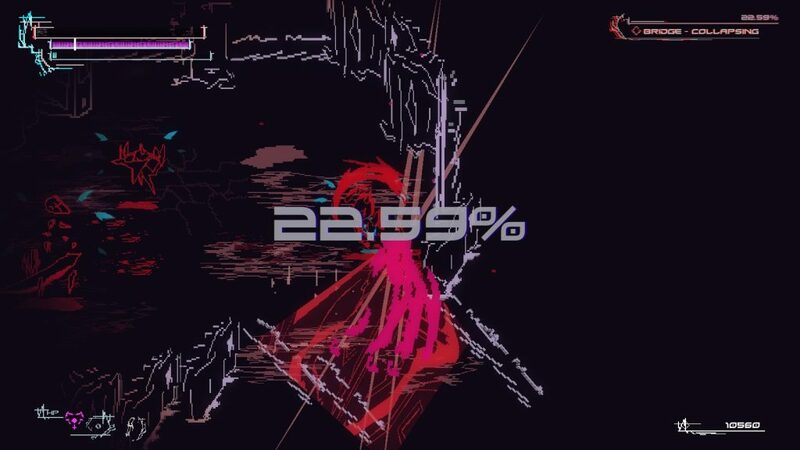 This is a game with a lot of reading, and a lot that can only be discovered through experimentation. Wait, you can Study with your Patrons? Damn, didn’t know that. You can get a rough idea of what an event or card wants by clicking the empty slot? Damn, didn’t know that at first. It’s simultaneously frustrating as hell, and some excellent marrying of narrative to mechanics. 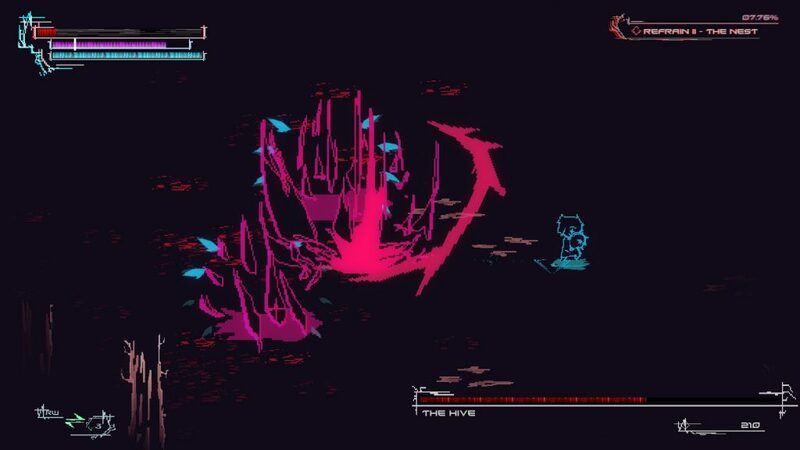 You are, after all, always a character unfamiliar with the occult elements of its world, by choice or no, but, as a player, I can’t deny I spent some time angry that progression seemed always a step away. What the hell do I do with this door? How do I deal with the deep, dark Dread in my life? (To be fair, that’s a question I struggle answering in life, as well as this game.) It doesn’t necessarily help that yes, even if you’re so close to earning that goal, that true glimpse that destroys and creates, something simple, something you’d overlooked, can prematurely end your dreams. Since a single run can sometimes last up to 10 hours, you can imagine why that’s so devastating. The cult members and patrons remain the same, even if the story changes, and this, also, is perhaps a flaw. 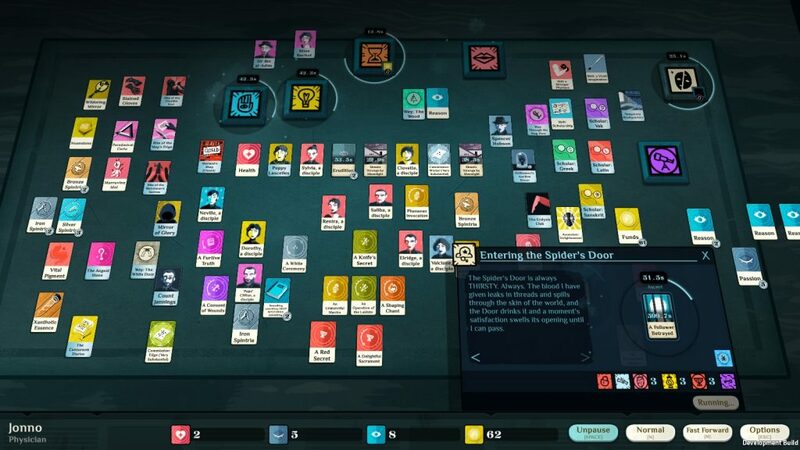 Cultist Simulator is interesting as all get out, and somewhat unique, both in terms of how it handles events, and how it uses a lack of tutorialising to its benefit narratively. I would recommend it to folks, because, interestingly, it’s using its flaws. Not perfectly, and there are still things that the game does that annoys the hell out of me (such as generating cards on top of other cards, or the magnet slots on events prioritising over events that are already being used, dammit dammit dammit, but it intrigues me with its well researched and written world, its subtle, mostly minimalist aesthetic, and… Not gonna lie, it feels good when you finally achieve your goals. The writing is excellent, and I mainly chose this screenshot for the folks who already bought the game. Some amusing… Poetic… Justice. The Mad Welshman loves new aspirants. It’s such a delight to discover how well each goes with Garlic Butter. 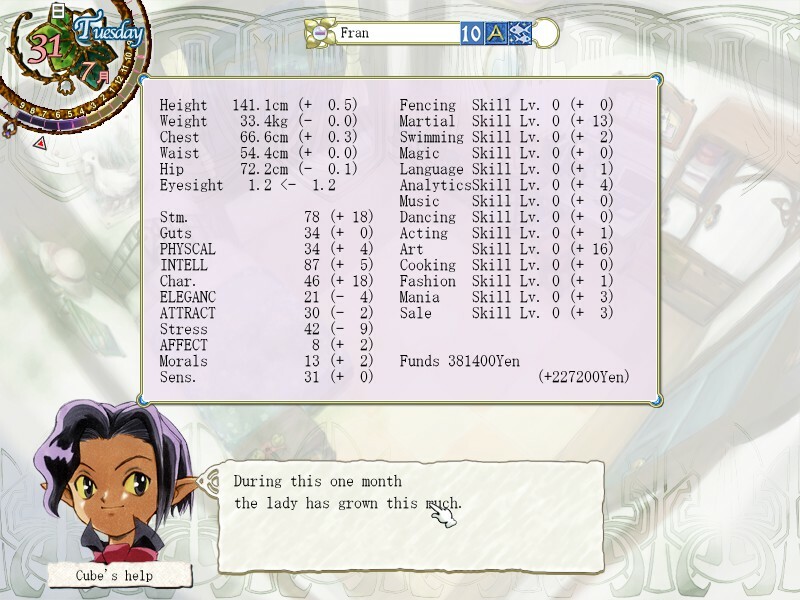 For all that the Princess Maker games are, in their way, somewhat unfriendly, there’s nearly always something delightful about raising your small child, be that into a great scholar, a dancer or musician, or a HELLION OF BATTLE. And Princess Maker 5, recently localised into English (A little clumsily, it must be said, but still mostly understandable) does well at showing the joyous end of raising children. So, the Princess Maker games have changed in the details many times over the years, but the core life-sim gameplay has remained the same: Schedule time for your daughter’s activities, grow her stats (while paying attention to her needs), take part in events, and, depending on what you’ve done over the years, get one of the many, many endings. For all that it is somewhat complex, since there are no, strictly speaking, bad endings (Or few, easily avoidable ones), I can somewhat forgive the unfriendliness of the Princess Maker series. This time, it’s set in the modern day, and adventuring has returned! 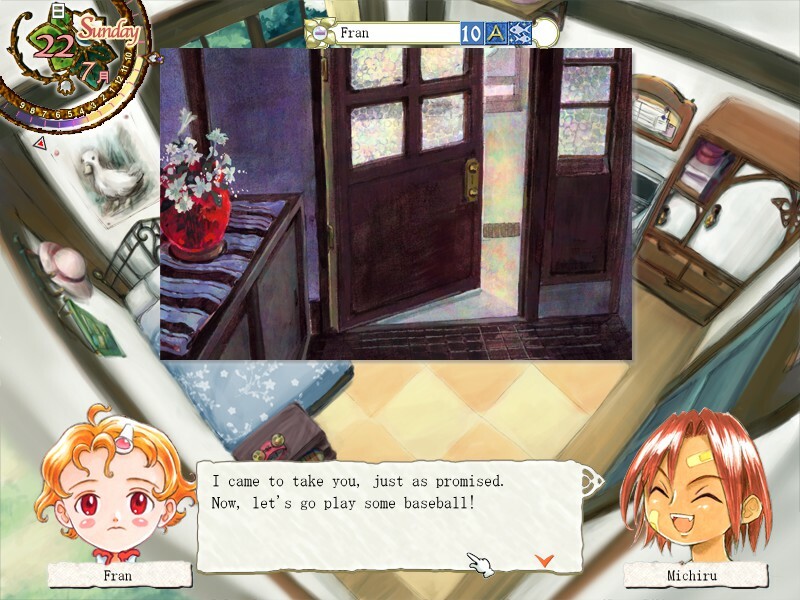 …But this, like many elements of Princess Maker 5, take time to get to. For the first year or two, it’s the usual deal of taking part-time jobs, studies, electives… Of making friends, and going to events to destress… Of buying Winter and Summer dresses (Sidenote: I enjoy how accurate the game is that children’s clothes are much more sodding expensive) , and, of course, exams. Mostly, features work as well as they did before. Weekly scheduling is better than PM3’s more confusing system, the town is hard to get around at first because you don’t, without a guide, know where anything actually is, and, if you’re looking for a specific ending, then you’re probably not doing it without a wiki. On the one hand, there are a *lot* of stats. On the other, don’t worry, focus on a few, others will come naturally. 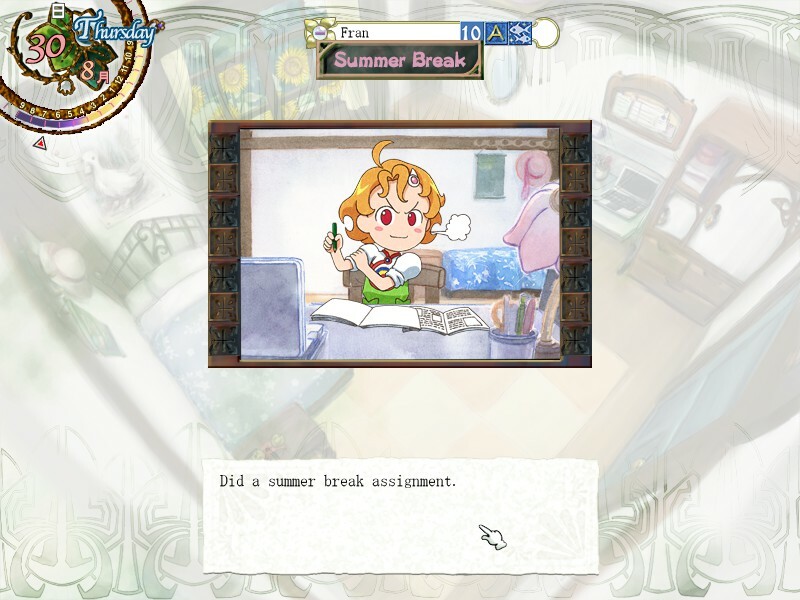 Still, the issues of an older lifesim game re-released aside, and some odd translations that seem odder if you don’t know Japanese culture (Bathe with your daughter is communal bathing, a common practice, and not anything filthy), Princess Maker 5 shines in one area in particular: The job animations. When studying or practicing skills, good performance feels good (Such as Athletics club, where she pulls ahead of the pack and wins by a nose), and when failure occurs? Well, I’ve winced more than a couple of times in sympathy, especially with Karate club, where failing to break those planks is… Particularly painful. There’s a lot of character to the daughter, and the cast is also characterful and interesting. Adventuring makes a welcome return, albeit with less control, but hey, adventuring, heck yes! If you like life-sims, Princess Maker was one of the first big series in the genre, and Princess Maker 5 is definitely worth a look. I wasn’t sold on the blond moppet at first, but the animation, the writing, and the world definitely charm, and, not gonna lie, one of the things that charms the most is the cultural references, such as going to see a Tokusatsu show and cheering on the protagonists twice a month. GO BLADE MAN! YOU CAN DO IIIIIT! As you deepen relationships, even more events unlock. Alas, love relationships are hetero only, but still… BASEBALL. The Mad Welshman would probably be a terrible parent in real life, but here, he’s raising a master of both art, both in the traditional and martial senses. Fran: The Demoness With A Paintbrush. 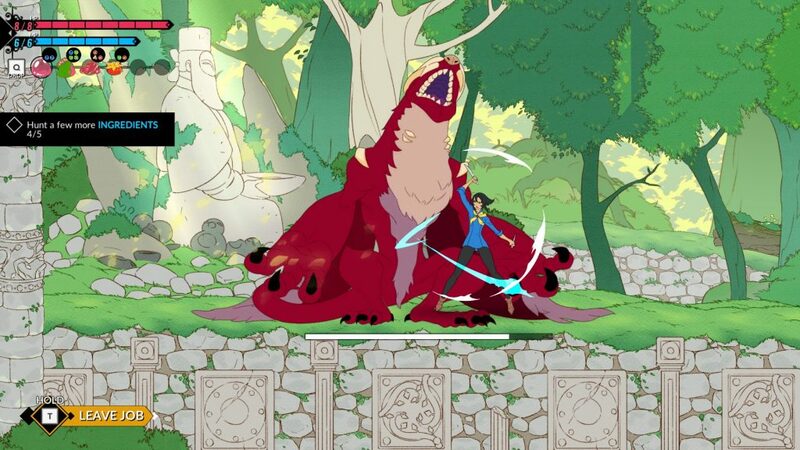 Battle Chef Brigade is charming. Its art style is clean, consistent, clear, and cool. Its music is very fitting and well crafted. It even fuses platforming combat, match 3 gameplay, and the tension of a real competitive cook-off. Although it at first didn’t seem to appeal much, it did grow on me, and part of that is how it introduces its mechanics. So much talent, all in one place… Oh, so jealous of the judges! Before we talk about that, though, let’s talk about aesthetic. Battle Chef Brigade is hand drawn, thin lines and flats making for a tight construction, with some good takes on fantasy designs, and similarly tight animations. Varied character design, good music, mostly good voice acting (some a little flat, but mostly good), and it ties into a world with something that I always enjoy seeing, because it’s a subject not often covered: How life changes in a fantasy world. Okay, so there are monsters, and magic. The former is deadly, the latter is potentially deadly. How do you apply the latter (and hunting) to the former, and still have a society that doesn’t have the dread Adventurer? Battle Chefs. Complete with a cultural touchstone of an Iron Chef style cookoff, with preferred tastes and signature ingredients. It’s a simple idea, but the entire story of Battle Chef Brigade revolves around making it both plausible and interesting. Here, the Orcs Thrash and Shiv, from lineages that peacefully united the Orc tribes through a shared love of cuisine. There, Ziggy, creating a new and very possibly unsafe (but tres cool) method in Haunt Cuisine. Necromantically prepared? Hit me up with those dark aftertastes, my friend! So, it’s an interesting world, its characters are engaging, but what about the play and main storyline? Well, here’s where it takes a bit, just a bit, to get going. If you recognise variations on the Hero(ine)’s Journey, you’ll recognise Mina Han. At first selfish, wanting to see the world, but still with promise (after all, she wants to improve a creative skill, I can applaud that), she learns hard lessons, faces a tribulation that affects both her and the world (I won’t spoil it), and becomes a better person along the way. Okay, so it may not win awards, but it has charm, and I like it. The dishes come in many types, and they’re all *eyewateringly* nice looking. 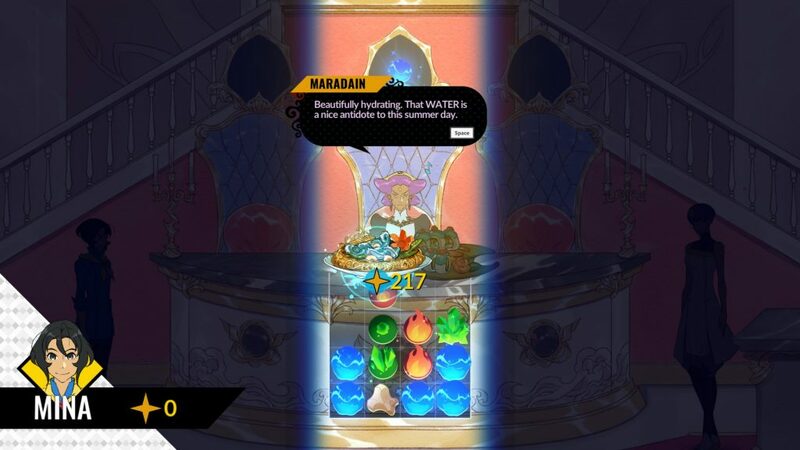 Similarly, the basic idea of using Match 3 mechanics with a cook-off makes immediate sense once you see it in action. Hunting down monsters in a themed arena area off to one side, gathering ingredients at first seems pretty basic: Wallop monsters, they die, they drop stuff, you can carry so much, run back and forth to gather ingredients. Ingredients have different gem types and shapes, three gems make one better gem, and you can do that twice before you have the best gem. How the heck does that fit with cooking? Well, there’s only so much room in the pot, and you can’t rotate the ingredients before placement. So, if you want to make the best dishes? You want to learn the ingredients, learn the biomes. As you go along, however, new mechanics, items, and explanations get introduced, pretty much all the way through the normal story mode. At first, this put me off, but it must be kept in mind that not only is there a New Game+ of sorts in Hard mode, there’s also two challenge modes, and a Daily Cook-Off, using fixed items. The story mode won’t take a terribly long amount of time, but it’s still enjoyable, and I did come to like the fact I’m learning new things every time I get further. Oh, wait, you can do that? The birds aren’t just assholes, but have a little ecology going? Ohhhhhh! 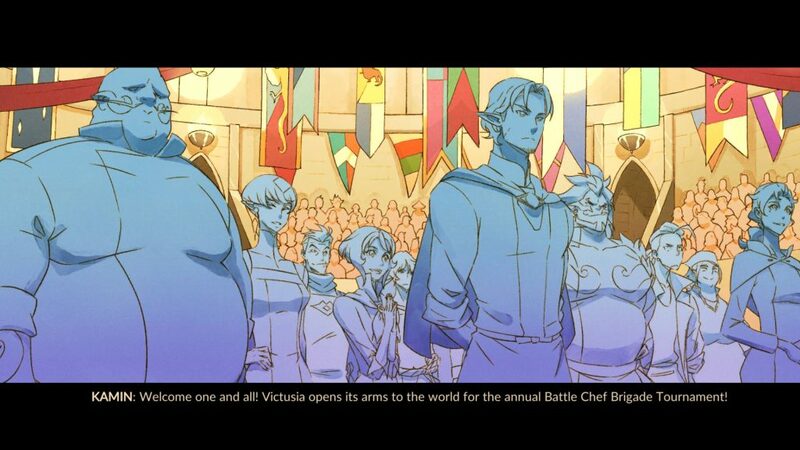 Overall, I have a soft spot for Battle Chef Brigade. It’s tightly focused on an aspect of its world that it’s made central, but it’s also made it believable, and not only believable, but charming. Thumbs up! Oh, y’know, just another day hunting for cooking ingredients in a cook-off! 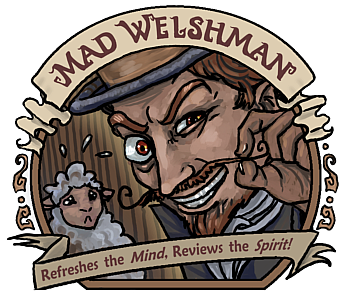 The Mad Welshman would, in a fantasy world, want Haunt Cuisine. Oh heck yes he would. Also he would order from the Flambe Warlocks.